Have you ever felt defeated? Have you ever felt hopeless? But on the inside, you are hurting. And when you enter the privacy of your home, you place your head into your pillow and cry. You wrestle with doubt and despair and wonder why you are the recipient of so much pain. You have so many unanswered questions and even more unanswered prayers. You feel lost and alone. Perhaps you even blame yourself. Entering a church building is not meant to be a facade where you don your mask and play the role of a perfectly self-assured, contented individual for those around you. On the contrary, it is with our brothers and sisters in Christ where our vulnerabilities and insecurities are not ours alone to bear. It is here, amidst our family, where our burdens should become lighter, being lifted by those who love us. The church still loves you when you’re broken. The church loves you when you’re doubting, when you’re struggling, and when you’re lost. And when you walk into church feeling weary and forsaken, you don’t need to don your mask. While you are crying, let us cry out to God for you when you are no longer able to form the words. When the load is too heavy and you begin to stumble, allow us the blessing of sharing the weight. When your mind is weary from your mental struggles, let us contend and grapple with you. When the road ahead seems steep and endless, let us climb it with you, arms outstretched to catch you. Because we were never meant to face our burdens alone. “Two are better than one, Because they have a good reward for their labor. For if they fall, one will lift up his companion. But woe to him who is alone when he falls, For he has no one to help him up. Again, if two lie down together, they will keep warm; But how can one be warm alone? Though one may be overpowered by another, two can withstand him. It’s hard to see God in the midst of trials. When you’re lying in a hospital bed for what seems like the thousandth time, praying for answers and getting none; when you’re staring into the casket of a loved one taken far too soon; when the job search is relentless and disheartening, and the words of rejection consume you; when temptations and sin seek us at our weakest moments and threaten to overwhelm us. That’s when we realize that our only hope is to cry out to Jesus. And our brothers and sisters in Jesus are there to guide and lift us back to Him when we have lost our way. One thing I love about Hoover is what happens when someone responds to the invitation. Inevitably, they are joined in their walk to the front by ten, twenty, thirty other members. When someone is coming to ask for prayers, to ask for forgiveness or to confess their sins, they never make that walk alone. The next time you are hurting or doubting or struggling, know that you don’t have to pretend. You don’t have to don your mask. It’s okay to not be okay. No matter your circumstances. No matter your doubt. No matter your past. You are never too broken. Last week, in the town of Cusco, I believe I witnessed this very proclamation come to fruition. Christians from opposite corners of the country, living hundreds of miles apart, joined together to bring love and hope to a foreign city. And not only did they encourage the people of Peru, they also encouraged me. As I gathered belongings and packed my bags to depart on this journey, I had no idea what to expect. As the mission came to a close, I was astonished and thankful to have been part of such a thoughtful and well-run mission. We set up our medical clinic in a complex located in the district of San Sebastian in Cusco, Peru. We set up stations according to various needs and had workers assigned to each station. 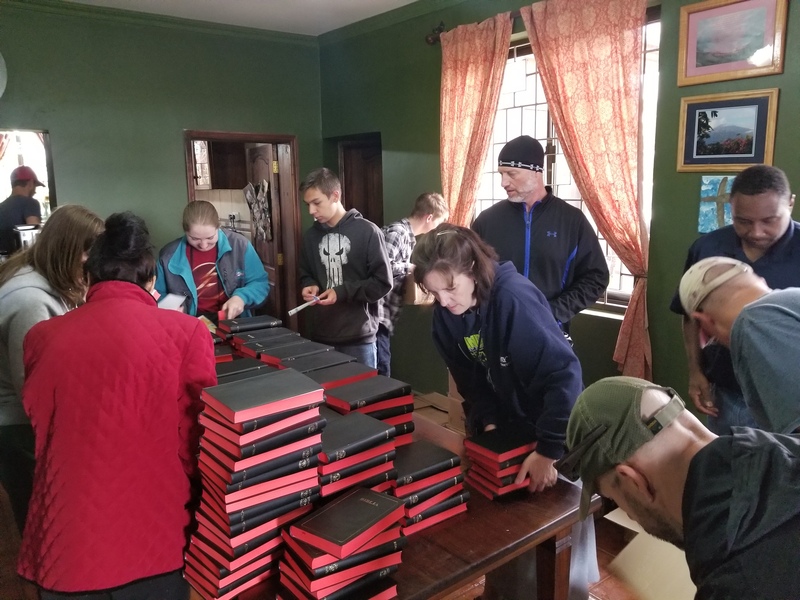 Each person began at the registration area and were sent to the appropriate stations from there, whether they were seeing the eye doctors, the medics, our triage group or receiving medication from the pharmacy. Bible studies were available but not required. We had one baptism and a host of sign-ups for future studies. There was also a children’s area set up outside. Hundreds of children were shown the love of Jesus throughout the week. We also had some really great lunches, thanks to our wonderful cooking crew. Every team member put forth their full effort for our mission. There was no such thing as a menial task. 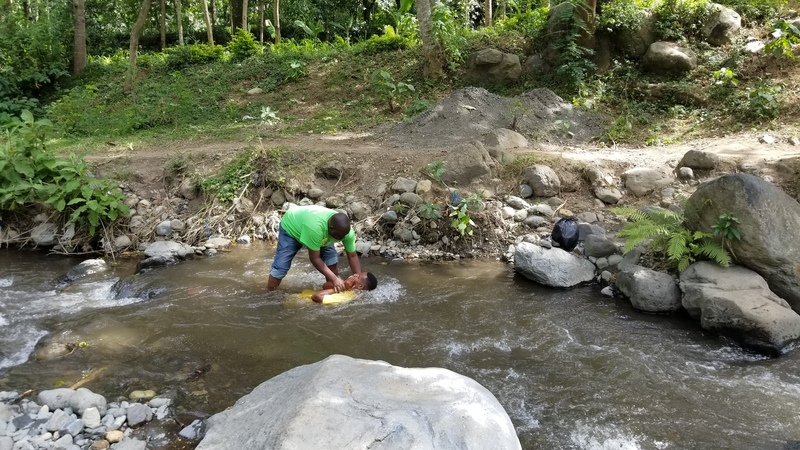 Whether a doctor, a translator, a children’s worker, a bathroom cleaner, a cook or helper, each task was necessary and done with a work ethic worthy of mentioning. I joked with these guys about being “guardians of the toothbrushes.” But honestly, their sense of humor and distribution of chocolate was exactly what I needed on the day I got sick. It reminds me that sometimes the smallest of gestures can make the biggest impact. The crowds grew steadily each day, as word spread about the clinic. People were lining up as early as 4:00am in order to been seen. On the last day, hundreds of people were already waiting when we arrived, and the line wrapped extensively around the gated premises. When we exited the bus, we were applauded, and I have never experienced a more humbling moment. All together, 1,855 people were treated at our clinic in Cusco. Every day at the clinic, I met at least one person who broke my heart. In one instance, I had to tell a little boy that we didn’t have glasses to match his prescription but that we would give him the best and closest that we had. And as the words left my mouth, I saw tears fill his eyes as he bravely accepted the fact that he still couldn’t fully see. Sometimes it’s hard to accept that you can’t help every person, despite every effort and all of your strength. But for every person whose story threatened to tear my heart to pieces, there were an equal number of acts that, one by one, pieced it back together. I saw our team members embrace visitors and cry with them. I saw them greet the patients by name and do their best to show them love in an unfamiliar place. Our doctors treated patient after patient, never wavering, sometimes through their own sickness, and always with genuine care. I saw the doctors laugh with their young patients and hug the old. The people of Peru received much needed treatment and medication and an equal amount of love. I am so thankful to be a part of a church that takes the word of Christ seriously when he tells us to love and serve one another. Misty mornings and hints of rain evolved into bright beams of sunlight as the earth beneath our tired feet turned from gravel to dust. We walked away from bustling storefronts and ramshackled buildings toward lofty trees with poster-sized leaves and vibrant flowers towering above us. 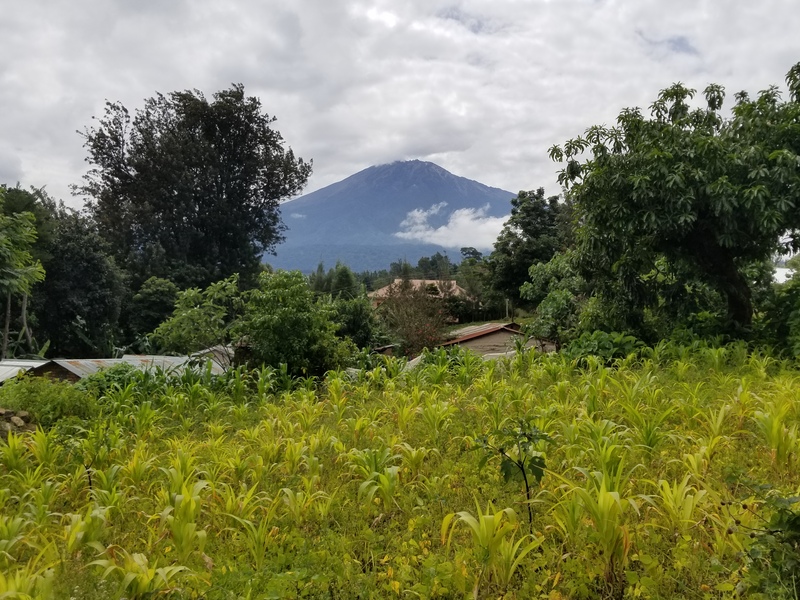 Scenes of Mount Meru appeared intermittently in the distance as the fog weaved its way through the towns. Dust trailing from the occassional piki-piki infiltrated our lungs as the occassional chant of “Muzungu! 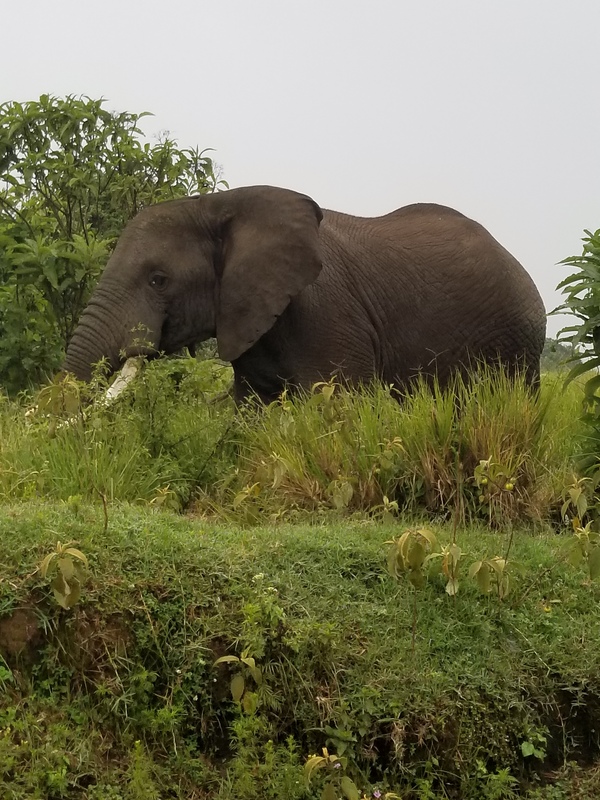 Muzungu!” was heard in the distance from children inquiring about these foreign strangers. 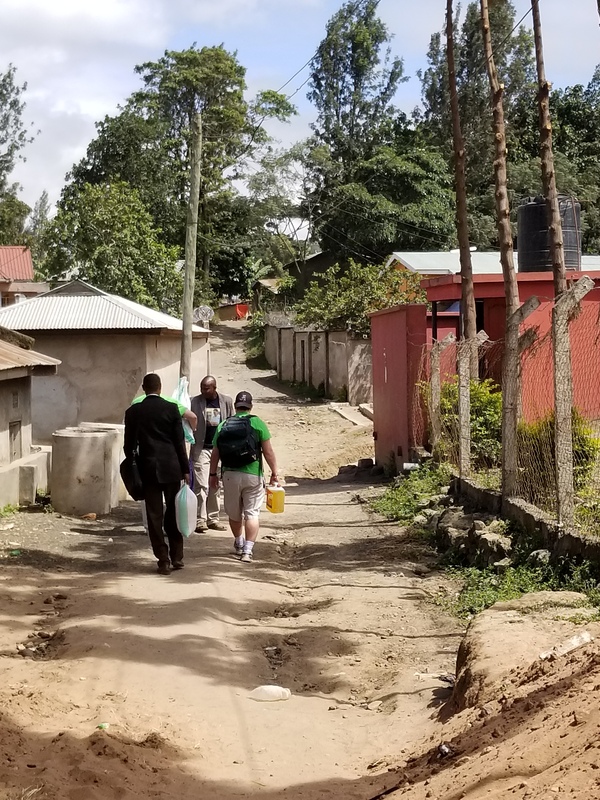 We chatted with our translator about the cultural differences between our homelands, but only shortly, as we walked between the hosts of Bible studies so numerous that we barely could reach them all. It’s a question I’ve been asked countless times and never fully know how to answer. It’s tiring. Sometimes, it’s emotionally exhausting. As you enter house after house, learning of more death and more illness. And people with a lurking sense of sadness in their eyes grab your hand and ask fervently for you to pray for them as they are preparing a loved one for burial. And these strangers who have only known you for thirty minutes treat you like family, with hugs and kind words, bidding for God to bless you. And through their grief, they still have a desire to know God, asking you to return for Bible studies after the burials of their loved ones are completed. And your heart aches for them, as they are grasping for the hope and peace that only a loving God can give. It’s also wonderful. It’s a community open to strangers as well as to each other. Children follow you through the towns, being welcomed into each home as much as you are. Many of the barriers that we encounter in the United States cease to exist. There is no faux mask of picture-perfect houses and a desire for spotless floors and counters as a pre-requisite for inviting someone into your home. Neighbors don’t hide reclusively in their houses, avoiding contact with other neighbors. That’s not even possible, as hard-working people are tending their cows, washing their clothes, feeding chickens or hosts of other chores necessary for living. I have never been a fan of the closed-off mentality that we have in the United States. Where we would rather sit around watching TV, ignoring our doorbell when it rings and being suspicious of knocks on the door. Nor am I a fan of the false sense of, and desire for, perfection..be it on social media or otherwise. Where we only show what we believe is the best part of ourselves and our possessions. Where we only post happy things or neglect to open our homes because we believe the smudges on our counter tops warrant being inhospitable. Sitting on a dusty, torn couch in a one room brick house with chickens running through the bed sheet hanging in lieu of a door, I oddly felt at peace. It is humbling. And sometimes it makes you feel ashamed. Ashamed for the things you complain about and for the things you take for granted. I complain about having to wait in traffic when I should be thankful that I have a car. I complain about slow wi-fi, as I sit in a nice house with a new phone in my hands. I complain about the never-ending pile of laundry that comes from having more clothes than I need. And while sitting on a bucket in a house in Africa, I never felt more ashamed for every time I complained about a first world problem. I have never purchased used sandals from a dirty wheelbarrow on the side of the road. I have never filled buckets of unfiltered, potentially dangerous water to drink. I have never had the government tear down half my house because they wanted the land on which it was sitting. And while I sometimes joke about having to live off of Ramen noodles, I know that I am not going to starve. May God forgive me for my frivolous complaints. It’s long and tiresome yet short and wonderful all simultaneously. The trip to Tanzania takes about 30 hours. It requires two bus rides and two very long plane rides. Personally, I love to fly so I don’t mind the trip too much, except for the jet lag. But I admire those who are scared of flying and still make the choice to go in spite of their fear. Even loving flying, the trip is pretty difficult. I couldn’t imagine going while being truly afraid. But that’s what love does. Love conquors fear (1 John 4:18). 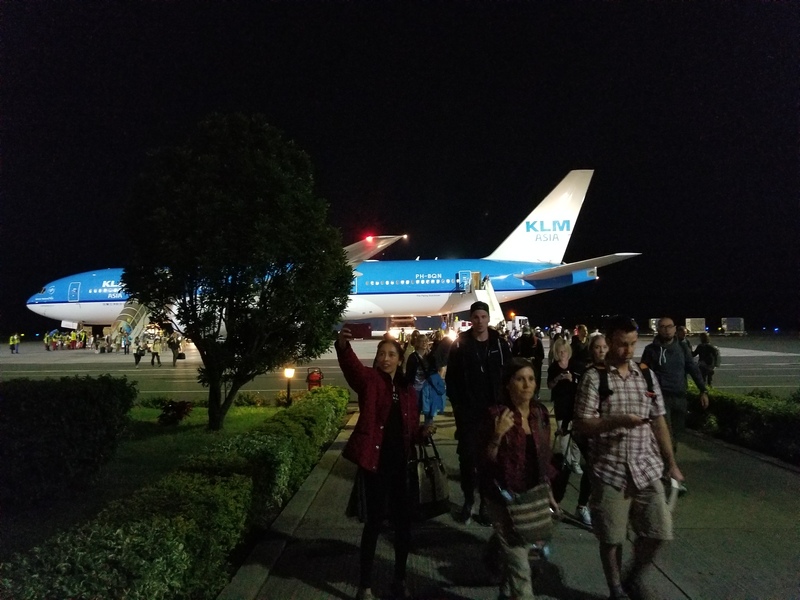 Stepping off the plane in Kilamanjaro is instantly mass chaos, as the airport is not large enough to adequately accommodate everyone. And sometimes the workers decide to make up rules on their own, such as last year when he had to pay an imaginary tax to bring our supplies into the country, or this year when they decided they were only going to provide the correct visas to half of our group. But in the end, that’s not what matters. The frustrations are soon greatly outweighed by the realization of what you have come there to do. And you take a deep breath, say a prayer, grab your bags, and step out into a country that will forever change you. The first three days are light days that involve preparing for the campaign while recovering from the jet lag. We also lead services and teach classes at any given congregation that Sunday. One day is a safari day, which is amazing but also the most tiring day. I literally fell asleep while being thrown around in the safari vehicle this year, which is indicative of why we have these rest days; we are utterly exhausted from travel and jet lag and need to wait until our minds are clear and alert before we can begin teaching. The day before the campaign has been deemed “encouragement day.” This is where we are able to deliver food and supplies to members of the local churches and give them lessons on encouragement. I personally love this day. Last year, after the lesson, we asked the lady with whom we had been studying if we could pray for her, and she cried and poured her heart out for probably twenty minutes. Then we gave her a bag full of supplies, and the one item that she pulled out was the Bible; and she pulled it to her chest and hugged it tightly with a gleam of joy in her eyes. I will never forget that study. And after the studies, we have food cooked for church members and a lot of children in the community. We then spend five days campaigning, where we walk through the streets and offer studies to anyone who would like to learn. And honestly, this is the part that will change you. This is where you encounter those people who are the epitome of Matthew 5:6, hungering and thirsting for the word of God. This is where complete strangers welcome you into their homes with a joyous “karibunisana” and, sitting on a bucket with a Bible in your lap, you realize all the things you’ve truly been missing. No, not the material things. The spiritual things, the hospitality, the loving your neighbor and, frankly, the gratitude and thankfulness that are often forgotten in the midst of our overly packed schedules and semi-truthful facebook posts. Suddenly you become reminded of them. And although you began this journey with a desire to teach and help others, often it is you who are taught more than you dared to even imagine. And for me, I know that I will never sing the words “shall we gather at the river” in the same way. At Hoover, we talk a lot about “senders” and “goers.” Well, I am a goer who is eternally grateful for all of the generous senders who help to make this trip a reality. I could never afford this on my own. But I absolutely love it, and I feel like I left a part of myself 8,000 miles away on a dirt path in the depths of Africa. So to all of the senders, I offer a very huge “thank you.” Thank you for loving others enough that you sent us to teach them. Thank you for loving others enough that you provided food and clothing for them. Thank you for entrusting us, myself especially, to be the messengers of the greatest news that has ever been told to people who are truly thirsting. One day while working at Winn-Dixie in high school, I took my lunch break outside on the bench, as I often did. After a couple minutes, a stranger had come and sat next to me. I had gotten free food from the Deli, and the man next to me remarked about how good it smelled. I knew I couldn’t eat it all, so I offered him some. That’s when he informed me that that was the first time he had eaten in two days. He said he lost his job and was caring for his sick mom and was really struggling. My break was ending, so I gave him the $3 I had in my pocket and headed back to work. He told me that he would repay me when he found a job. Obviously, I never expected to see that money again and told him not to worry about it. Fast forward a few months, and who walks into Winn-Dixie? The man I had met on the bench. He told me he’d found a job, handed me $3, thanked me again and left. I was ringing up customers in my line, and I never even got his name. I wonder if he knows that I still remember him twelve years later. I constantly see and hear people complaining about those who ask for money. It’s popular to be cynical and jaded and believe that every person is trying to scam you. It’s easy to avoid eye contact and pretend that you don’t hear. A lot of people would probably call me gullible for helping strangers. Do scammers exist? Obviously. Have I been scammed? Yes. I once was left standing in downtown Enterprise, holding a bag of 6 hot dogs that I had bought for some woman and her apparently imaginary family, as she had bolted out the door while I was paying for her food. I usually offer to buy food instead of giving money for that very reason. And if I’m being completely honest, that woman made me very angry. Does that mean that I now have an excuse to stop helping other people? No. Anyone who knows me probably knows of my great disdain for Black Thursday (and Black Friday). But two Black Fridays ago, I was driving around Montgomery around midnight and decided to stop into the Chantilly Wal-Mart. I left empty-handed, feeling really dismayed at the hoards of people all trying to beat each other to the next item that nobody needed. On the way out, I saw a woman standing on the street corner with a sign asking for money. I don’t typically give cash, but I offered to buy her some food. I drove to McDonald’s, the only fast food place that was open, picked up a McNugget meal and came back. Something compelled me to talk to the lady, rather than just handing food and driving away. I learned that her name was Roxanne, and she was homeless. She had stayed in a homeless shelter for a while, but the few remaining items that she had left had been stolen in the shelter, so she decided that living on the street was better than living with thieves. She was always worried about where her next meal would come from, and very worried about her safety. She wanted nothing more than a night or two in a hotel so she could take a shower and sleep in peace. I wonder what would happen if we all stopped letting the media dictate our lives. What would happen if we stopped letting the news stations fill us with fear and convince us that we always have to be skeptical of our neighbors? What would happen if we stopped letting the commercials drive our greed and started buying a hotel room for people like Roxanne instead of fighting over useless toys and speakers in Wal-Mart in the middle of the night? What would happen if we actually talked to people before we made judgments about their character, simply because their lot in life has not been as nice as ours? A few weeks ago at work, I had a mom and daughter come to my register whose behavior had been a little disconcerting. It’s not unusual to see strange behavior at work (just yesterday I had a man start rambling about government conspiracies and his friend getting stabbed in the heart..). While I was unsure about this particular pair, I proceeded as usual. Then the mom became somewhat eccentric and left halfway through the transaction, saying she had to sit down. I was trying not to become annoyed, and suddenly the daughter’s demeanor changed. She apologized and whispered to me that her step dad (the mom’s husband) had recently killed himself, and this was her mom’s first attempt to leave the house after it happened. She had hoped it would be good for her mom, but the mom was obviously having trouble. I was taken aback. And I was humbled and embarrassed at my judgment of these people who were obviously hurting and grieving. You never know what people have been through or the issues that they face. The next time you decide to discount someone for holding a sign on the highway, perhaps try talking to them instead. It doesn’t mean that you put yourself in danger. You can still use common sense. (Pro-tip: If they’re actually homeless, they will have a backpack 99.9% of the time. If they don’t, where are they storing it?). Let’s just help each other, not only as Christians, but just as human beings who are all trying to find our way, occasionally becoming lost ourselves. One Fall day, I was making my way through the door exiting Shackelford Hall. I had been dealing with a serious illness, unable to leave my room for a few days. I was in a lot of pain, still in pajamas, with unbrushed hair, painstakingly making my way toward Cafe a la Carte, desperate for food. I had experienced this exact scenario several times, always being met by awkward looks and sideways glances of strangers struggling to avoid eye contact. On this day, I was met with kindness by one girl to whom I had never spoken. She asked me if I was okay, and when I explained the situation she nodded with understanding. She took my arm in hers and walked with me, painstakingly slow, to get food, helping me to walk and letting me lean on her for support. That was the instant Keisha Dawson Kubala came into my life. Admittedly, Keisha and I seemed like an unlikely pair. We often joked that our first thoughts of each other were very unbecoming. I had seen Keisha at the CSC before she spoke to me that day outside of my dorm. She was wearing clothes two sizes too big, loudly moaning and laying on the chairs while occasionally rolling back and forth. I thought she was crazy. I later learned that she had just had surgery, hence the big clothes and moaning in pain. I also later learned that she had thought I was the crazy one before meeting me. We laughed about it a lot. It makes sense that Keisha was the one person who stopped and asked if I was okay. It turned out that she recognized my pain because she suffered from it, too. She understood me like no one else, and we were able to lean on each other when we had nowhere else to go. One day when I was incredibly sick, unable to get out of bed, she showed up to my dorm room with no less than eight different kinds of candy and the movie 13 Going on 30 that she had bought just to cheer me up. And she sat on the floor, surrounded by mounds of candy, and brought joy to my heart when I had none. I have many vivid memories such as that one. And many memories of tears and confessions and laughter through heartache. One day she found me in the Saga parking lot, doctor reports in hand that were approximately twenty pages long, with unfavorable news of an irregular heartbeat. And when she showed them to me, she laughed, even though I knew she was scared. But that was the greatest thing about knowing Keisha. She taught me to laugh through pain and how to deal with my sickness. She helped to bring me out of a depression that I never talked about. Keisha Dawson Kubala was the type of friend that everyone needs but nobody deserves. Least of all, me. One night she called me crying, and I ran to her dorm in the rain with no jacket and no shoes. I just ran. And she often brought this instant to light, as if I had done some amazing thing. But how could I do anything else? For this friend who laughed and cried with me, who comforted me and gave me hope, how could I do anything less? Our friendship was one for the books, and Keisha was as unique of an individual as has ever walked the earth. She was loud and bold and often misunderstood. And I loved her for it. Keisha was the friend I would call at 2am when I was having trouble sleeping. She was the friend I would call when another doctor ‘s appointment left me in tears, feeling hopeless. She was the friend I would call when I felt that life was too mundane and I needed some excitement. Every day with Keisha was literally unforgettable. There was the time she convinced me to visit a graveyard with her at midnight because she wanted to show me a statue she thought was terrifying and she said its eyes would follow you. So I went, and then we both were terrified and couldn’t sleep, so we were in WalMart until at least 2:00am trying to calm down. There was the time we were house sitting for someone and she decided to hold this person’s pet snake. But instead, the snake got loose, and we spent the rest of the night coaxing it into a pillowcase. That was also the night we heard strange noises outside, grabbed various objects for protection, and Keisha charged the door with what I am pretty sure was a broom handle. Turns out, it was Alan. Then we laughed hysterically because we were idiots. I will never forget her laugh. Keisha was always willing to prank anyone, whether the prank was good or bad. We got caught a couple of times, and even after she left Troy, she still contacted me to help with long-distance pranks. At one point, we were harboring her dog in the dorms. Whoops. And to date, I still use that comforter on a weekly basis. She gifted it to me because I didn’t have one. We had the same weird sense of humor that a lot of people didn’t understand. One day I went to the thrift store and found, what can only be described as, a dinosaur on a stick. And when you moved the dinosaur, he would roar. He rode in my back seat for a long time, and any time we hit a bump, he would roar and we would laugh. At one point, he had a home in Keisha’s back pocket, as she carried the roaring dinosaur around campus. And then there was the time we had been hanging out for several hours, swapped clothes with each other and then revisited people we had seen that day to see if they would say anything about our clothes. Mostly they just looked at us strange. Because we were strange. But I wouldn’t trade our strangeness for anything in the world. When Keisha left Troy, I was devastated. We spent our last day roaming campus, being weird and meeting as many new people as possible. She stopped a group of international students and asked them if we could take pictures. She was outgoing and friendly and never met a stranger. While I was so sad that she leaving, I was happy for her. I was happy for her to find stability in marriage with someone that she loved. And I was so proud of her when she signed up to serve our country. I’m thankful for the times she called me when driving through. Even though we would just grab dinner, we would still spend the time laughing. And no matter how much time went between dinners, it felt like none at all. I regret not travelling to see her. But I hope she always knew how much she meant to me. And I hope I can be half the friend to others that she was to me. Wait for me on the other side, my friend. I’ll see you again someday. I really appreciated the presentation that Chuck and Sid recently gave about Tanzania. I realized, though, that there is so much substance that it’s very difficult to put into just an hour. As they were clicking through pictures, I started thinking about all of the surrounding stories happening in those pictures. So here is my feeble attempt to tell you the stories that you may not know. There were twelve of us who made the trip to Tanzania. In this photo, we had just said good-bye to our families in preparation to board the church van and be taken to the airport. I did not know anyone on this trip very well before traveling to the other side of the world with them. Boarding a plane with people you don’t know very well to travel across the globe to a place you’ve never been leaves you with a lot of emotions, mostly excitement and a small amount of apprehension. We experienced a few setbacks on our journey due to passport issues. Eddie and Chuck had to spend an extra day in Atlanta while the rest of us headed to Tanzania. Their bags took even longer to arrive than they did. Our first flight was eight hours from Atlanta to Amsterdam. Our second flight was nine hours from Amsterdam to Tanzania. On our second flight, an announcement was made on the plane, asking for a doctor. Very thankfully for a lady about two rows behind us, we had three doctors on our flight. An elderly woman had internal bleeding, and we could hear the conversations between the doctors and the pilot. They needed to land the plane to get the lady to a hospital, but we were flying over the Congo and the Sudan, so there was nowhere to take her. They ended up hooking her to IV’s and having to wait until we landed in Tanzania. Our journey was a bit more eventful than we had hoped, but we made it safely, and I was very impressed with everyone’s attitudes despite the unfortunate circumstances. Our arrival in Tanzania was very eye-opening and revealed immediate corruption. After securing our work visas and paying extra money to be allowed to enter the country (because we’re Americans), we prepared to retrieve our bags. 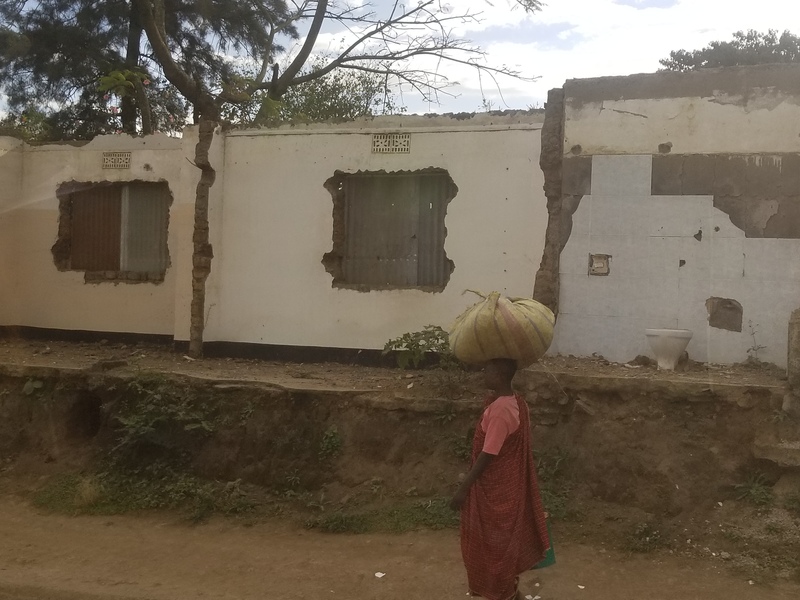 As we were getting our luggage, we were stopped by Tanzanian officials of some sort and were told that we could not have our bags of supplies that we brought for the locals. We were then told that they had implemented a tax on imported goods (a “new rule” that was not written anywhere). They pilfered through the bags, stated a random tax percentage and estimated cost of our goods and informed us that we would have to pay $1,000USD in order to have our supplies. The supplies included food, medicines, clothes, and toys that were to be given to those in need. After much debating and a huge hassle, we were allowed to have our bags for $500USD. Many props go to Sid for his handling of the situation and his positivity throughout everything. On our first day in Tanzania, we were given a tour of the school of preaching where we were staying. We learned about the work and future plans of the school to become self-sufficient by raising animals and growing crops. Given the amount of jet lag I was experiencing at that time, I honestly do not remember many specific details. I just remember that I was very impressed at the hard work and the willingness of everyone to participate in such a process. We spent the next day bringing supplies and offering encouragement to members of the church and the community. Doreen, Dunia, Mkunde (our translator) and myself went to the home of a local church member. (I will refrain from pictures or specific names, simply because I do not want to invade anyone’s privacy.) We took her a duffel bag full of food and supplies, as well as toys for her son. Overall, this was a very emotional morning. Doreen talked a lot about encouragement, and we all talked about times in our life when we really needed to be encouraged. When Doreen asked the lady if she had any struggles in her life that she would like to talk about and have us pray for, tears immediately began to fall and she began to sob. She was struggling with discouragement, with life in general and a situation that she did not know how to handle. I felt like she had been holding so many things inside of her for so long, and just really needed someone that cared to simply ask her how she was doing and be willing to listen. After talking and praying, we presented the lady with a duffel bag full of food, clothing, first aid supplies, and a few other things. She was obviously very thankful. But after searching through the bag for a while, her eyes suddenly lit up. The one item that she pulled from the bag was the Bible, and she held it to her chest. I was somewhat abashed, realizing exactly how much I take my access to the Bible for granted. We then made our way to the church building at Kwa Morombo, where the Hoover church paid a local restaurant to serve food for us and the locals. Dunia and I were unable to finish our meals and a lady sitting near us asked if she could have our leftovers to take home to her family. Of course there were no ziploc bags or Tupperware. She found a plastic Walmart-type bag and put the leftovers in it and tied it up. Once again, I was reminded of how much I take for granted. 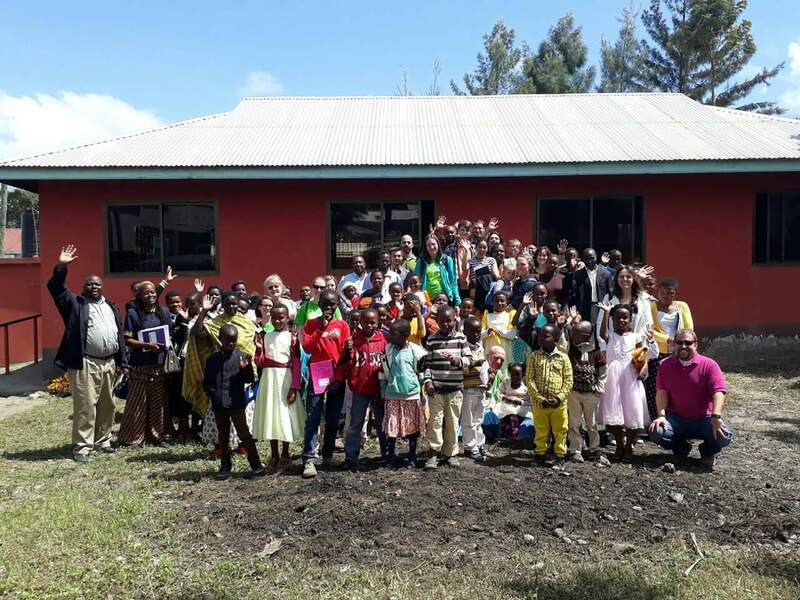 On our first Sunday in Tanzania, we were blessed to worship with the Mount Meru congregation. The four benches on the right are where we held the adult Bible classes. 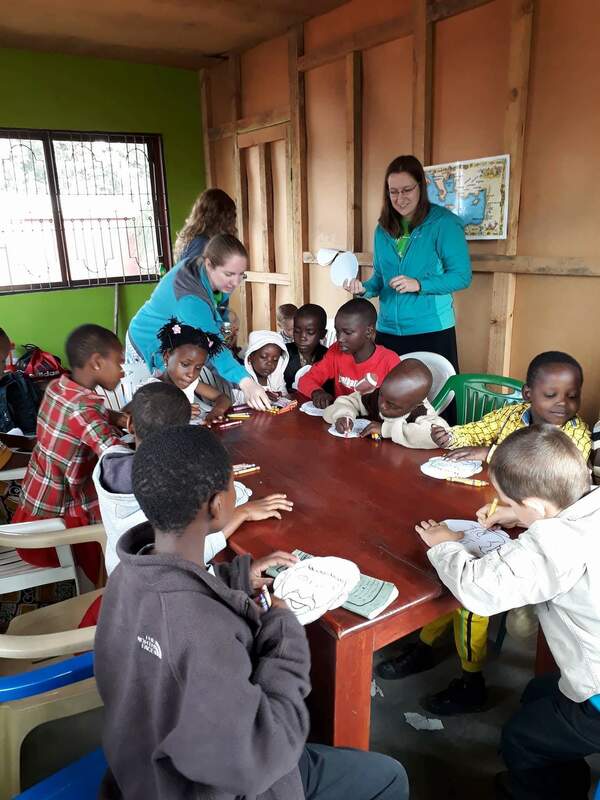 There is only one room in the church building, and the children stayed inside for their class. We moved the benches back inside for worship services. There is something really incredible about worshiping with your brothers and sisters in Christ who do not speak the same language as you. You connect with each other even when you cannot verbally communicate. During this church service, I looked down the row and realized that three of us sitting together all had Bibles in different languages. The magnitude and vast expanse of God’s magnificence and saving grace struck me in a way it never had before. We took one day out of our mission work to explore the richness of God’s creation through a safari. 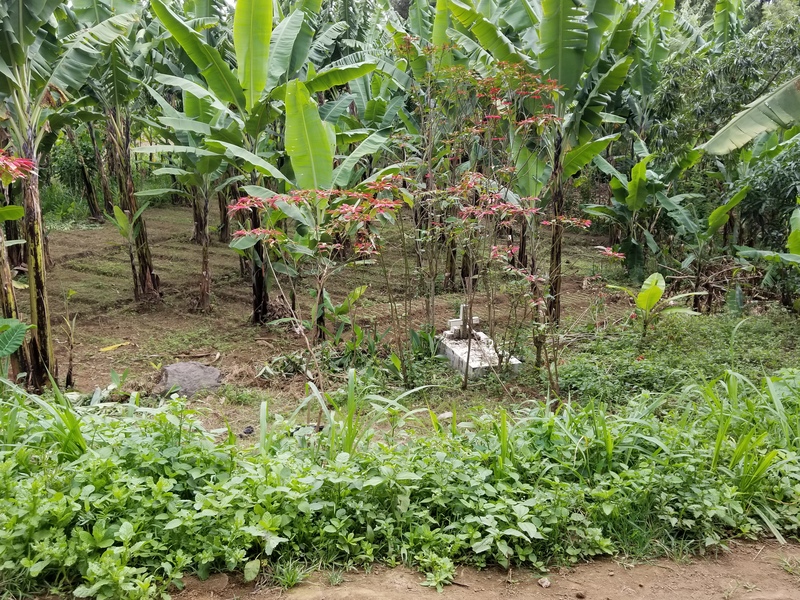 Normally, I am not an advocate of doing “vacationy” things during a mission trip, but I would like to share with you exactly why this day was important to me. On this day, I really began to know my team members as friends. We weren’t dealing with airport security or preparing lessons or distributing supplies. We simply got to know each other as individuals. We got to laugh and share stories. We fell on top of each other when hitting holes in the road. We ate too much junk food and somewhere, on someone’s phone, there is a video of Kendyll and I singing “I Just Can’t Wait to be King” to the African prairie. I am so blessed by my church family. And it was on this day that I really knew what a great two weeks I would have, being able to call these people my friends. Being awe inspired by God’s handiwork was an added bonus. On Tuesday, our campaign began. It was exciting, tiring, nerve-wracking, inspiring and, on occasion, a little bit frustrating. We set out around 9:00am every morning, walking the streets and asking people if they would like to learn about the Bible. We were allotted an hour for lunch, but I often witnessed our team members foregoing their meals because they were having studies. We were set to end around 5:00 each day, but again, some people gave extra time and missed meals when they found people who were eager to study the Bible. And upon arriving back to the school at night, we would often still be studying. There were equal parts rejection and acceptance. Some days were very exciting and other days required us to “shake the dust off our feet.” Overall, the campaign resulted in sixteen people being brought to Christ. The campaign resulted in many other things. I met so many wonderful people throughout our mission, whether they were church members or otherwise. Most of our studies resulted in mutual respect and friendship. And whether or not they decided to put on Christ in baptism, they have been shown the love of Jesus and a seed has hopefully been planted in their hearts. For me personally, the campaign resulted in so much change to my heart and to my life. I think about Tanzania every single day. I think about this wonderful family who offered what they had to us. I think about these lovely people who were so excited to receive Bibles. Dunia had the idea to write personalized messages in the front of Bibles. When we wrote them for the first lady, the others began asking for us to do the same. I will never forget how lovely and appreciative these ladies were. One of them ran a small shop and on our last day, she gave us free Coca Cola and would not let us pay her. I think about this girl, who will always be a source of inspiration for me. Her name is Jamilla, and she became a Christian just a few days before we arrived. She spoke impeccable English and came to our campaign every day, asking anyone she could find to study the Bible with her. May we all have a desire to study the Bible like Jamilla. And where would we be without our wonderful translators? We would be so lost! They guided us around the streets, translated for us and became our friends. I loved seeing children on the streets and watching their faces light up as we gave them toys. I loved worshiping in a tent and having so many people in attendance that we could not all fit. It is a stark reminder that the church is not the building but rather the people who love Christ and do their best to show that love to others. I loved seeing my church family in action, offering love and support and teaching others the Bible. It is so encouraging to be surrounded by people who care so much about other people and who would literally give the shirt off their back to help those in need. Kendyll even tried to hand out pamphlets through the windows while we were stopped in traffic, making the best of a bad situation. 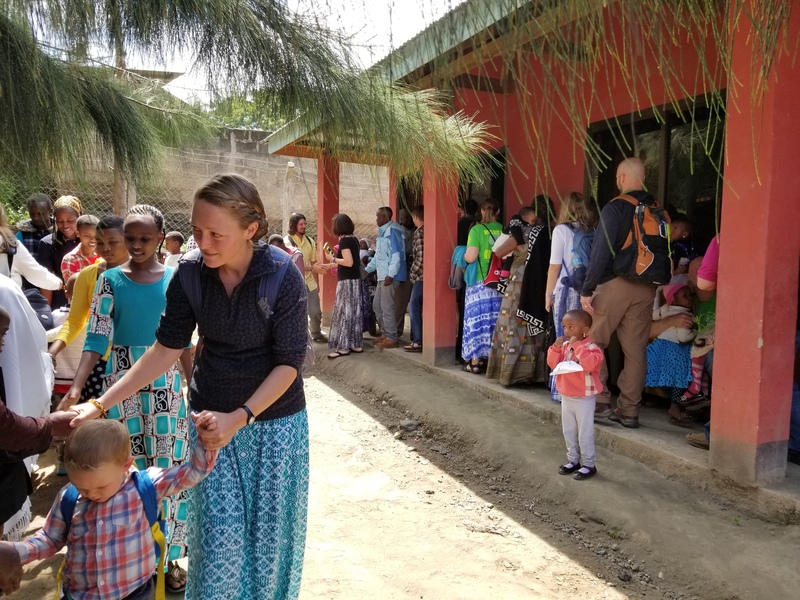 I loved getting to know my church family and the other missionaries who graciously offered their homes and their help to us throughout our time in Tanzania. Special thanks goes out to Justin and Anna Maynard for bringing me medicine when I got sick and to Daniel and Tiffany Gaines who provided us the best Taco bar I have ever eaten. The trip was not always easy. There were rainy days and sleepless nights, jet lag and exhaustion. There were long plane rides and missed meals, and a dire need for some Pepto Bismal and Dramamine. But those are extremely small prices to pay for the privilege of spreading the gospel. I don’t remember how many people I studied with or gave supplies to. But I know that with each person, each study, each moment, I was changed a little bit more. I signed up for this trip hoping to be a help and encouragement to Africa. But in reality, it was Africa that helped and encouraged me. If the swim dock could speak, what would she say? If Pioneer had ears, what things would she have heard? If Cabin 4 were living, imagine the secrets she could keep. Perhaps the swim dock would tell you tales of triumph. She would tell you about young girls learning to swim, often for the first time. She would tell you of lifeguard trainings and water relays, treading water and buddy tags. She would tell you of laughter and games of Marco Polo, and of silly dogs who run circles around the dock, of KK Olympics and the most beautiful sunsets you have ever seen. If Pioneer could hear, perhaps she would have heard the laughter of young children away from home for the first time, learning brand new things about life. She would hear the soothing voices of caring counselors, comforting the young children who are feeling homesick. She would hear the crackling of embers on a Wednesday night campfire and the sounds of cicadas luring everyone to sleep. If cabin 4 were living, she would tell you of incessant laughter and shed tears. She would tell you of best friends and campers who count a cabin as so much more because it really is their home. She would tell you of late night talks of shared secrets, cabin raves, and a view from the back door that will forever be etched into the minds of all those lucky enough to call her home. I spent fourteen summers at Kamp Kiwanis. I grew up there. A piece of my heart is still there and will always be there. The experiences I was fortunate to have and the resulting love for Kamp are not things that can be explained to those who never experienced it firsthand. The stories will never hold meaning to those who did not live them, and the song lyrics will not touch the souls of those who never sat around a glowing campfire with tears in their eyes, wishing they could stay forever. Kamp Kiwanis taught me about life. I was eight years old the first time I attended summer camp. I was in a level one swim class, unable to even float, and the thought of swamping a canoe completely mortified me. I remember the excitement of passing the swim class and the feeling of victory upon swamping my first canoe. Things that may seem so simple were actually big things to an innocent eight year old who was just learning about the world. The feelings of pride and accomplishment at overcoming fear would stay with me and Kamp would continue to provide so many opportunities for growth and learning that I would carry with me forever. Kamp Kiwanis taught me many practical things. I learned how to swim and canoe, how to build a fire, how to pitch a tent, perform CPR and provide first aid. I learned teamwork skills and leadership skills. I can navigate with a map and a compass and I can spot poison ivy from a mile away. All of these things have been beneficial to my life, but perhaps even more important than those practicalities are the life lessons that have completely shaped my entire being. No place has taught me more about friendship than Kamp Kiwanis. Kamp is magical when it comes to friendship. Even without seeing each other for an entire year, you completely pick up exactly where you ended the year before. A Kamp friend once told me that family isn’t necessarily blood related. In my life, this has been exponentially true, and the love that I have for my Kamp friends runs deeper than blood. When I graduated high school, my own sister did not show up to my graduation ceremony. But two of my Kamp friends each drove two hours and completely surprised me at my graduation. My own sister did not attend my wedding. But I was showered with love and attendance from campers and counselors, nurses and camp directors, who have become such an integral part of my life. My Kamp friends have encouraged and cheered for me, laughed with me, and cried with me. Their friendship is unparalleled and so much more than I deserve. Kamp Kiwanis has taught me a spirit of resilience and tenacity. Her traditions are in my heart and soul, and though some do not understand and wish to diminish them, still her spirit does not fade. For several years of my life, I was a frequent visitor of hospitals and surgical centers. During this time, my years at Kamp had to be suspended. Against all odds, and after having a total hysterectomy at the age of 22, I recovered enough to be able to return to the Kamp that I called home. My first year at Kamp after my long and arduous medical endeavors, I painted a rock. While painting a rock would seem so trivial to most people, it was, to me, a silent victory. It was a tradition that began during a terrible time in my life and one that I was sure I would never be a part of. But to paint my name on a rock, at a place so loved, that I thought I would never be well enough to return to, and to place it in the Earth where others would see, symbolized something so much greater to me than just a rock. It was a sign that I had overcome something that I was told was impossible, and that I, like that rock, would never waver. But not long after, that rock was broken, along with many others. And my soul ached as I watched them be destroyed. Thinking back on Kamp, her traditions were a major factor in why I continued to return year after year. Without her traditions and the people who keep them, what is she? She is just a plot of earth with some tents and water, much like other places on earth. I remember being in awe, as a Pioneer and as a Ranger, seeing the Mariners who had been to Kamp for eight, nine, ten years…and I wanted to be just like them. I couldn’t wait to have the “awesome cabins,” to have stripes and feathers, to be able to camp on Mariner Island, and to be able to attend the two week session. The silly antics of “King Neptune” kept me guessing and wishing that I could join them, and when I was finally old enough, I was definitely not disappointed. And when I became a Mariner, I found that the stability of Kamp would do more good for me than anything else in my life. No matter what tumultuous issues were being faced at home, I knew that I had Kamp, that my friends would always be there, and that I could always count on her to enrich my soul. My most favorite part of Kamp Kiwanis, hands down, was her Thursday night campfires. As a kid, I loved walking through the woods, thinking that I knew the statues and then changing my mind. I was proud of the fact that I could sing all the lyrics to the songs that the “Indians” knew. As I got older, I loved the singing and the reading of quotes and poems. I loved the burning of candles and the placing of wax. I loved getting new stripes and being completely ecstatic when I obtained a full set. I feel like I can still hear the voices of my fellow Council Scouts lifted up in song, amidst the sights of burning embers and the sounds of cicadas and the wind as it rustles through the trees. The melodies of “500 Miles” and “Barges” often echo through my mind when I think about Kamp. And the words and music of “Wisdom” hold a special place within me, as they were a favorite of our dear friend Katie who left us far too soon. My wax-filled rock holds a prominent place in my home. It holds wax that was dripped from candles over many years by countless people who have changed my life. Some of those people are my best friends. Some of those people were acquaintances who touched my life for a season. Some of those people are sadly no longer with us on this Earth and I will never have the opportunity to see them again. But when I look at my rock, covered in wax, I remember them. I remember standing in a circle with them, candles burning and making wishes together. I’m sure many of those wishes were like mine…wishing it didn’t have to end. I believe I have laughed more at Kamp Kiwanis than at any other place on Earth. From King Neptune to pudding drops, watching Sport and Keebler go beaver shark hunting, our disastrous yet hysterical prank that left us stranded in the lake, game nights, skit nights and ridiculous antics that are not acceptable at any other place, I have often laughed until tears rolled down my cheeks. I have yelled lyrics to unit songs with more passion and fervor than most people have for life itself. I have battled freak tsunamis and terrifying storms that sent metal canoes flying through the air. I have pranked and been pranked and have proudly shown my beaver shark scars. I have paddled canoes with broken broom handles and played games of Spoons and ERS for hours on end (with battle scars to prove it). I have laid my sleeping bag on the ground of an island, with no tent or shelter around me, and stared above at the vast expanse of stars, while being surrounded by people that I love. None of these memories would exist without the incredible counselors and camp directors that put their heart and soul, not only into Kamp, but also into teaching us and caring for us. I was very blessed to be under the guidance of counselors who were long-time attendees of Kamp Kiwanis. Their love for her was unmistakable and their knowledge of all activities and procedures was unmatched. It was obvious that they loved their jobs and that they loved us. We loved Kamp because they loved Kamp and instilled that love in us. And we loved them because they loved being with us and consequently demonstrated that love by teaching and caring for us without hesitation. Every summer, they greeted me by name at the front gate, before I even entered the campgrounds. They sang their hearts out after every meal, not because it was required, but because they wanted to. And even after being at Kamp for five and six weeks, with little to no sleep, they kept high spirits and a sense of humor when I am very certain they must have been completely exhausted. The year I became a counselor and finally decorated my counselor mug, it was more rewarding than any medal or accolade. Those outside of Kamp Kiwanis will never understand what we do. When I talk about loving how Kamp used to be, people accuse me of not liking change. In fact, I do like change. But I happen to believe that every girl deserves the experience of a Kamp that enriches, enlightens, encourages and empowers her. Every girl deserves the counselors that greet her at the front gate by name, every year, without fail. Every girl deserves to have the kind of Kamp friends and counselors that return year after year, not just because of the Kamp but because of each other. Every girl deserves a place that emboldens her by teaching her skills that can literally save her life. Every girl deserves to have such an amazing experience at Kamp that she stands in a circle with her friends on the last day and cries because she has to leave. If I were to write about all the reasons I love Kamp Kiwanis, I suppose this blog would be exponentially too long. So I leave you with this, my favorite portion of The Legend of Kamp Kiwanis. I cannot read it without picturing a Thursday night campfire and perhaps the greatest group of people I have ever known.